This impactful event will include a large exhibition of small businesses and corporate supply chain executives waiting to connect with your company. 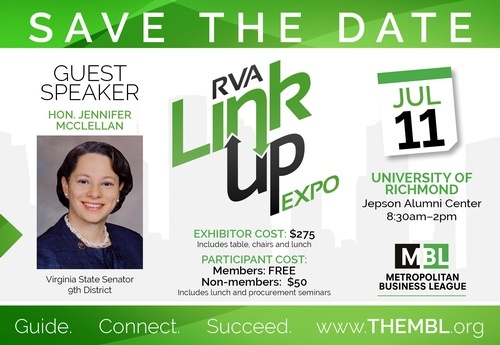 Whether you are looking for corporate, government or small business customers, a teaming relationship or just a great opportunity, the RVA LinkUP Expo is where you want to be. Small businesses will have the rare opportunity to network face-to-face with procurement and purchasing officers while larger corporations can connect with HUBzone, service-disabled and diverse suppliers. ORGANIZATIONS EXHIBITING LAST YEAR LOOKING TO DO BUSINESS WITH SWaM BUSINESSES? Throughout the day you will have the opportunity to have meaningful conversations with organizations looking to do business with SWaM businesses, learn about opportunities available, and gain more insight into how to grow lasting business relationships. You will also have the opportunity to participate in procurement informational sessions with State, Federal and Corporate professionals Coffee service and lunch will be included.